Background and objectives Patients with ESKD are sedentary. When patient-identified barriers to exercise are addressed, recruitment and retention in exercise trials remain low, suggesting that the trial design may not resonate with them. Therefore, we conducted a survey of patients on dialysis to assess perceived benefits and barriers to exercise and discover preferred outcomes and exercise type by dialysis modality and age in anticipation of designing future randomized, controlled trials. Design, setting, participants, & measurements English- and French-speaking patients with ESKD treated with hemodialysis or peritoneal dialysis were recruited from two tertiary care hospitals in Ottawa and Montreal, Canada. Summary descriptive statistics were used to describe patient responses; then, they were separated by dialysis modality and age category. Results The survey was completed by 423 participants. Current activity levels were similar across modalities (P=0.35); 78% of younger patients walked at least 10 minutes at a time on 3 or more days compared with only 58% of older patients (P=0.001). The two most desired benefits of exercise were improved energy (18%) and strength (14%). The third priority differed, such that improved sleep, maintenance of independence, and longevity were selected by patients on peritoneal dialysis, patients on in-center hemodialysis, and patients on home hemodialysis, respectively. Older patients were most interested in improvements in energy, strength, and maintenance of independence, whereas younger patients were interested in improving energy, longevity, and transplant candidacy. Only 25% of patients were able to exercise without difficulty; the major barriers for the remaining patients were feeling patients were feeling too tired (55%), short of breath (50%), and too weak (49%). If patients were to exercise, they wanted to exercise at home (73%) using a combination of aerobic and resistance training (41%), regardless of modality or age category. 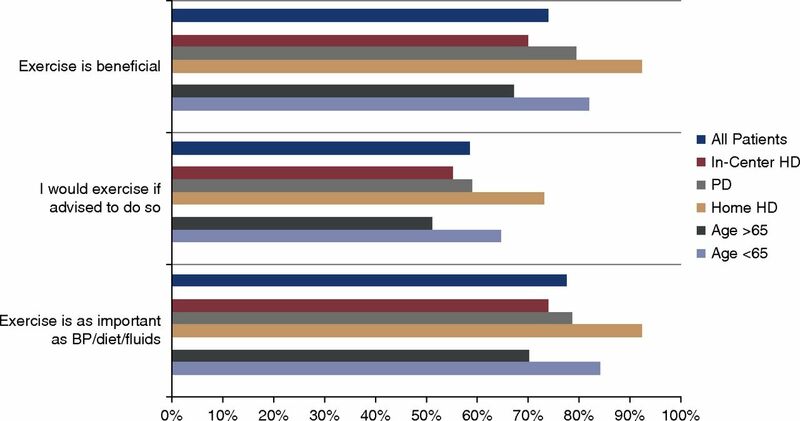 Conclusions The majority of patients undergoing maintenance dialysis in two tertiary hospitals in Ottawa and Montreal report similar desired outcomes and barriers, with greater differences by age category than modality. ESKD is a major health problem, with >25,000 Canadians and 450,000 Americans receiving dialysis (1,2). Patients with ESKD have an unacceptably high mortality rate and poor quality of life (3,4). In Canada, 1.1% of the health care budget is spent on 0.06% of the population; in the United States, 6.7% of the total Medicare budget is spent on <1% of the population (1,5,6). Although much of the cost is related to the dialysis treatment, approximately 20% is secondary to hospitalization (1). Because of increasing functional impairment that begins soon after dialysis initiation (7), patients with ESKD experience 1.6–2.8 falls per person-year, which are associated with 4.4 and 2.5 times greater risks of hip fracture and mortality, respectively, than patients not on dialysis (8–10). Several factors are responsible for the poor quality of life and marked functional impairment in patients on dialysis, including high burden of comorbid disease and dialysis-related side effects. In other chronic disease populations, increasing physical activity through exercise has been reported to improve quality of life, improve physical function, and reduce hospitalization (11,12). Despite the potential physical and psychologic benefits associated with exercise, patients with ESKD are sedentary (13). A number of barriers to exercise were identified in a study of patients on hemodialysis (HD) in the United States, including fatigue on dialysis and nondialysis days and shortness of breath (14). Patients on HD also identified a lack of time on dialysis days, a lack of places to exercise, and costs associated with the use of fitness facilities and public transportation as barriers to exercise (15). Even when many of the barriers are removed, recruitment, adherence to protocol, and retention in exercise trials remain low, suggesting that the trial design may not resonate with patients (16,17). To our knowledge, patients with ESKD have not had an opportunity to participate in exercise trial design. We, therefore, conducted a survey of patients on dialysis to assess their perceived benefits and barriers to exercise as well as preferred outcomes and exercise program type by treatment modality and age; we anticipated differences in responses by these broad patient categories that might affect exercise trial design for patients with ESKD. We modified a survey that was used in a study of American patients on dialysis that evaluated physical function and barriers to exercise (14). A question was added regarding dialysis modality, because the original study was only in patients treated with HD. We removed several of the questions on physical activity and function and expanded the section on demographic data to include the Charlson Comorbidity Index in lay terms (18). Questions were embedded within the survey to allow for calculation of each patient’s frailty score (19). Finally, we also expanded the exercise section to include questions about what type of exercise patients would prefer (aerobic, resistance, or combined), location where they would prefer to exercise (home, dialysis unit, etc. ), potential outcomes of an exercise program, and whether they would be willing to participate in a future exercise trial. After the first draft of the survey was completed, a copy was sent to the Patient and Family Advisory Council of the Champlain Local Health Integration Network Regional Renal Program. Members of the council made several recommendations that were incorporated into the next version of the survey, which was then reviewed by one patient treated with HD and one patient treated with peritoneal dialysis (PD). Additional modifications were made to the survey on the basis of their input to develop the final version of the survey (Supplemental Appendix). We obtained research ethics board approval at both centers (Board of Record: Ottawa Health Science Network Research Ethics Board), and the trial adhered to the Declaration of Helsinki. Return of the survey was considered implicit consent to participate. Patients were recruited from two tertiary care hospitals in Ottawa and Montreal (Ottawa Hospital and Centre Hospitalier de l’Universite de Montreal, respectively), from August to November 2017. We invited all adult English- or French-speaking patients who had been treated with HD or PD for at least 3 months to participate in the survey. Patients with significant cognitive or visual impairment that would prevent completion of the survey, patients who could not read, and patients with significant physical limitation that would prevent participation in an exercise trial were excluded. There were approximately 1000 patients on HD and 250 patients on PD in the two hospitals, of which we estimated approximately 70% would be eligible. Surveys were distributed to patients on PD and patients on home HD during their regular home dialysis clinic visit. Patients with ESKD treated with in-center HD were approached during their regular HD sessions. The number/type of illnesses and weight loss over the last year were determined from the patient’s electronic medical record (EMR). The type of illness was used to verify the accuracy of the patient-completed Charlson Comorbidity Index; the number of illnesses (more than five) and weight loss (>5% in 1 year) were used in addition to the embedded survey data (too tired to exercise [for fatigue], able to walk one block, and able to climb on flight of stairs) in the calculation of the FRAIL scale score (Ottawa only). A score of three or greater of five indicates frailty. The number of patients screened, reasons for exclusion, and the number of patients who declined to participate were documented. Summary descriptive statistics were used to describe patient responses to each question (mean and SD, median and interquartile range, or percentage) and then separated by dialysis treatment modality. In addition to dialysis modality, we explored response by age <65 versus ≥65 years old using chi-squared or Fisher exact tests as appropriate. Statistical analysis was done with Microsoft Excel (2016; Microsoft Inc., Redmond, WA) and JMP (version 8.0; SAS Inc., Cary, NC). A total of 607 patients were approached to participate in the study (419 patients on in-center HD, 29 patients on home HD, and 159 patients on PD); 423 completed and returned the exercise survey (280 patients on in-center HD, 26 patients on home HD, and 117 patients on PD) (Figure 1). The average age of patients was 63±15 years old, with the patients on home HD being younger than the in-center HD or PD populations (Table 1). The patients on home HD were more likely to be employed, be married, and have a higher income than the PD and in-center HD populations. Only 10% and 15% of the in-center HD and PD population, respectively, were working full time, about one half were retired, and about 20% were on disability. The Charlson Comorbidity Index and frailty scores were similar across the modalities (Charlson Comorbidity Index from EMR reported due to differences between EMR and patient-reported illnesses). Participant flow diagram. Seventy percent of screen participants completed a survey. iHD, in-center hemodialysis; PD, peritoneal dialysis. Patients ≥65 years old compared with those <65 years old differed by employment, marital status, education, income, and Charlson Comorbidity Index score but not by frailty (Table 1). Over two thirds (68%) of patients walked at least 10 minutes at a time on at least 3 of the last 7 days. Over one third (34%) participated in moderate physical activity, and 12% participated in vigorous physical activity. These proportions did not differ by modality, but they were significantly higher for younger versus older patients (Tables 2 and 3). Eighty percent of patients reported being able to climb one flight of stairs, and 76% could walk one block. On a Likert scale from one (strongly disagree) to five (strongly agree), the majority of patients (74%) believed that exercise would be beneficial for them, and 57% either agreed or strongly agreed that they would exercise if advised to do so by their physician. These percentages were higher in younger versus older patients and patients on home HD (Figure 2). Exercise is important to dialysis patients regardless of modality. HD, hemodialysis; PD, peritoneal dialysis. When all modalities were analyzed together, the top two desired benefits of exercise were improved energy and strength. The third priority differed by modality, such that improved sleep, maintenance of independence, and longevity were selected by patients on PD, patients on in-center HD, and patients on home HD, respectively (Figure 3). Quality of life benefits are the most important exercise related outcomes for dialysis patients regardless of modality. HD, hemodialysis; PD, peritoneal dialysis. When the desired benefits of exercise were analyzed by age, older patients were more interested in improvements in energy and strength and maintenance of independence, whereas younger patients were most interested in improving their energy, increasing longevity, and improving transplant candidacy (Supplemental Figure 1). When asked about ability and desire to exercise, only 8% of patients indicated that they were not interested in exercise. Of the remainder, 25% of patients reported no difficulty with exercise, whereas 29% and 37% reported a desire to exercise but either had difficulty with exercise or were unable to exercise, respectively. For those patients who stated that exercise was difficult or impossible, the most commonly cited reasons of 13 possibilities were feeling too tired, too weak, or short of breath (Figure 4). 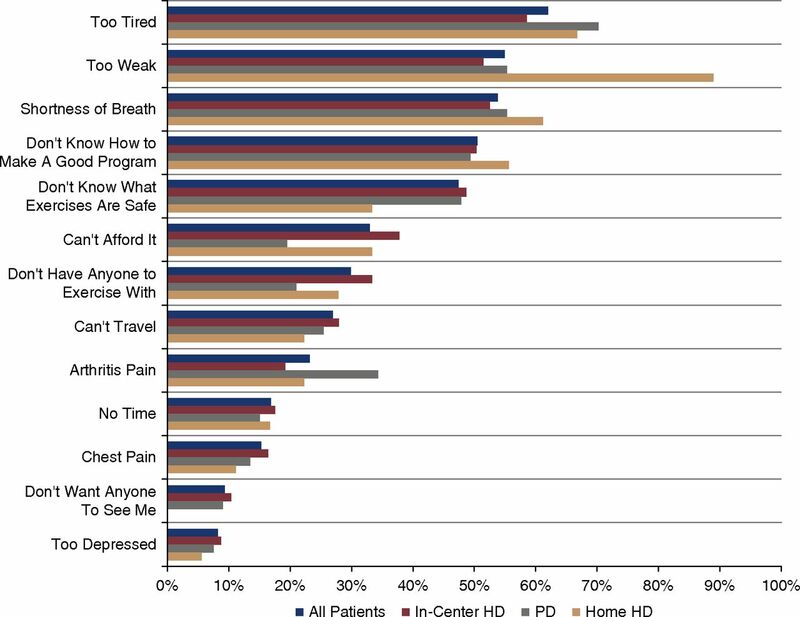 Notably, almost 90% of patients on home HD listed weakness as a barrier to exercise compared with approximately 50% of patients on in-center HD and patients on PD. Inability to design a good exercise program, lack of knowledge about safe exercises, and cost were ranked fourth, fifth, and sixth. 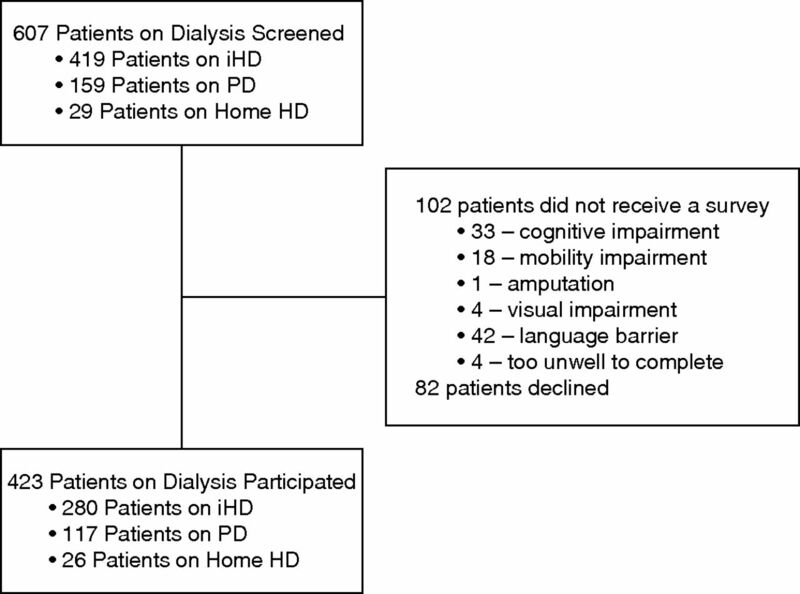 There were no significant differences in desire or ability to exercise between patients treated with different dialysis modalities, with the exception that none of the patients on home HD indicated that they did not want to exercise. Barriers to exercise exist for many dialysis patients regardless of modality. HD, hemodialysis; PD, peritoneal dialysis. Results were very similar when assessed by older (≥65 years old) and younger (<65 years old) patients, except that older patients were more concerned about their ability to develop a good exercise program (ranked this as the third highest barrier) (Supplemental Figure 2). When patients were asked where they would prefer to exercise, they listed their home (73%) as their preferred exercise location followed by their neighborhood (33%), the gym (30%), and lastly, the HD unit (23%). The home was favored by every dialysis modality and by older and younger patients (Tables 2 and 3). Patients on in-center HD, patients on home HD, and patients ≥65 years old ranked the neighborhood second, whereas patients on PD and patients <65 years old ranked the gym above their neighborhood. The majority of patients indicated that they would prefer an exercise program that consisted of both aerobic and resistance training (41%) versus either (22% aerobic only and 21% resistance only) or neither (17%). Although the results by modality were not different statistically, the patients on home HD seemed to be the most interested in an exercise program that included resistance training (Table 2). Combined aerobic and resistance training was preferred, regardless of age (Table 3). Approximately one half of the surveyed patients indicated that they would be interested in participating in a future exercise trial (48% of patients on in-center HD, 52% of patients on PD, and 72% of patients on home HD). When evaluated by age, 46% of older patients were interested in participating in an exercise trial compared with 58% of younger patients. Patients with ESKD are sedentary in spite of all of the potential benefits of exercise in this patient population. In the few randomized, controlled trials that have been published about patients on in-center HD, the recruitment and retention rates are low. Almost nothing is known about patients on PD or patients on home HD. For this reason, we undertook this multicenter survey of patients with ESKD treated with PD, in-center HD, or home HD in anticipation of designing future patient-oriented exercise trials. We identified several barriers to exercise in this population—predominately fatigue, shortness of breath, and weakness. In addition, patients are primarily interested in exercise as a mechanism to improve quality of life as opposed to reduce heart disease and hospitalization. Results across modalities are fairly similar; greater differences of opinion were seen when assessed by age. More than 30% of the patients who completed our survey had not walked at least 10 minutes at a time on three occasions over the last week; very few engaged in vigorous physical activity. Our results are in agreement with several other studies. Fatigue has been described as a primary barrier to exercise participation in patients with ESKD (14,20). Our results also suggest that fatigue is the main barrier to exercise for Canadian patients on HD and Canadian patients on PD. 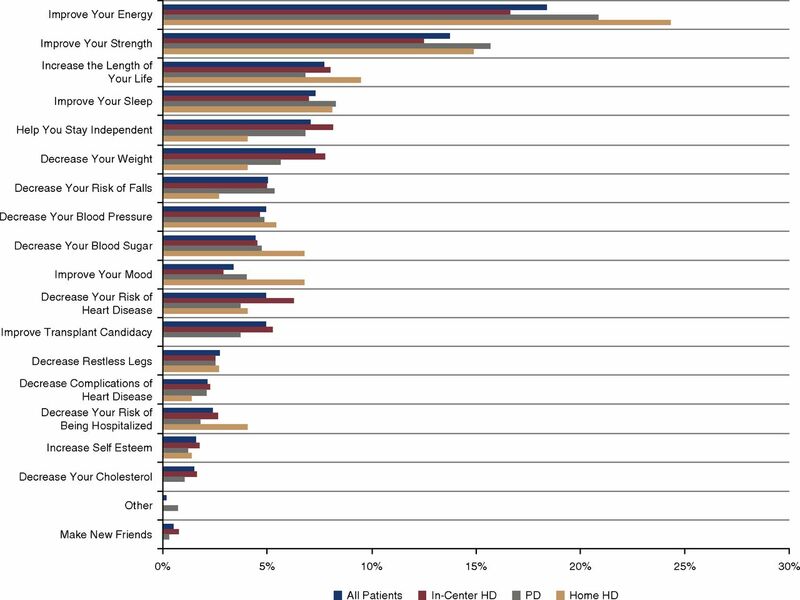 Although fatigue was one of the top three barriers to exercise in our patients on home HD, they reported weakness as the primary barrier to exercise more often than those patients treated with in-center HD or PD. It is unclear why such a large proportion of patients treated with home HD reported weakness as their primary barrier to exercise, especially given their younger age compared with other patients on dialysis. Our patients on home HD dialyze 3–5 d/wk, mostly on a nocturnal schedule. The additional workload associated with machine setup/take down may lead to the perception of weakness. Alternatively, it is possible that the longer and/or more frequent dialysis sessions may result in enhanced removal of molecules, such as carnitine, that are important for muscle function, but this is speculative. One of the major difficulties with exercise research in the dialysis population has been recruiting and retaining patients in studies. There are several potential reasons for this. There may be a disconnect between researcher and patient priorities in terms of location and objectives. There seems to be an increasing interest in evaluating the role of intradialytic cycling exercise programs as a way to increase physical activity in the population of patients on HD (21,22). However, in our study, the HD unit seems to be the least preferred location in which to exercise. This observation is supported by several other studies. Patients on HD had concerns about the burden created by intradialytic exercise programs on already busy staff (23). The staff similarly has concerns about the feasibility of maintaining an intradialytic exercise program (23,24). Patients also expressed concerns about the safety of intradialytic exercise and did not want other patients or staff to watch them exercise (23). The problem does not seem to be the cycling intervention, because an intradialytic low-intensity strength training pilot feasibility trial also had about one third of eligible patients decline to participate on the basis of a lack of interest (25). Designing an intervention that takes place in the HD unit also excludes a large proportion of patients with ESKD who dialyze at home. Although it may be necessary to design modality-specific exercise protocols, our study suggests that the two patient populations seem to have similar barriers to exercise and desire similar outcomes. Even when the exercise intervention seems to be in the right location on the basis of our survey, recruitment of patients and maintenance of high levels of participation remain challenging. The Exercise Introduction to Enhance Performance in Dialysis Patients trial included a simple walking intervention in the home to determine whether exercise could improve physical function and measures of quality of life (16). Almost 40% of eligible patients declined. Of the participants who were randomized to the intervention exercise arm, level of adherence to the program was low in 47%, and twice as many patients in the exercise group did not complete the study compared with the control group. For patients burdened with fatigue and weakness, anything beyond maintenance of activities of daily living may be overwhelming. This is consistent with almost 70% of our patients stating that they walked >10 minutes at a time on at least 3 days in the last week, but only 25% of our participants said that they could exercise without difficulty. Perhaps if the walking program had been incorporated into activities, such as walking into the dialysis unit or going shopping, the retention rates would have been greater. Additional patient motivators, such as pedometers or enrollment in social networks, may also be necessary to help patients remain motivated in future exercise trials (26,27). It is also unclear if the patients understood the implications of improvements in the Kidney Disease Quality of Life, Short Form and the five sit-stand test as measures of quality of life and strength, which would have been logical outcomes on the basis of our study results. A few additional issues were highlighted in our study that have implications for future trials. Cost still remains a barrier to exercise and must be considered in trial design. The most popular exercise program desired by patients on dialysis included a combination of aerobic and resistance exercises. This is consistent with the results of the study conducted by Cho et al. (22), in which the combination exercise group had the lowest dropout due to loss of interest. This study, however, had a limited sample size, and larger studies will be needed to confirm these findings. Age seemed to have a greater effect on opinions about exercise than dialysis modality. Patients with ESKD over the age of 65 years old appeared to be less active than their younger counterparts. The primary desired benefit of exercise—improvement in fatigue—did not differ by age. However, there were notable differences in other desired outcomes, with improvement in strength and maintenance of independence being critical to older patients compared with longevity and transplant candidacy for younger patients. This has important implications in trial design and messaging for recruitment into exercise trials. Although the majority of patients felt that exercise would be beneficial for them, only 57% either agreed or strongly agreed that they would exercise if advised to do so by their physician. About the same percentage stated that they would be willing to participate in an exercise trial. This will be important to consider in sample size calculations and also, study design, in which interventions that contribute to maintenance of behavior modification will be vital to the success of the trial. Our study has a number of limitations. We excluded patients who were unable to read in English or French, potentially excluding ethnic minorities who may have different opinions about exercise. We also excluded individuals who were unlikely to be able to participate in a future exercise trial, such as patients with amputation of one or both lower limbs. These individuals may also benefit from exercise, but we did not collect information about their perceptions of exercise. We are also unable to comment on differences by frailty, because very few of our patients were classified as frail by the FRAIL scale. This may be secondary to the performance characteristics of the scale or our exclusion criteria. Lastly, we did not approach patients in our satellite dialysis units for logistical reasons, limiting our conclusions to the patient populations living within the cities of Ottawa and Montreal, and our study may not reflect the opinions of patients in our more rural communities. In conclusion, the majority of patients on dialysis included in this study, regardless of modality, believe that exercise would be beneficial, but they report several barriers to participating in an exercise program that will need to be addressed in any future trials. The fatigue and weakness experienced by patients may mandate an exercise program that can be incorporated into their activities of daily living at home or in the neighborhood. Patients are predominantly interested in improvements in quality of life (fatigue, weakness, and sleep) as their desired exercise outcomes such that these need to be highlighted in trial design, which may enhance recruitment and retention rates. This article contains the following supplemental material online at http://cjasn.asnjournals.org/lookup/suppl/doi:10.2215/CJN.09700818/-/DCSupplemental. Supplemental Appendix. Exercise in patients treated with dialysis questionnaire. Supplemental Figure 1. Preferred outcomes of an exercise program by age. Supplemental Figure 2. Barriers to exercise by age. The authors wish to thank the Patient and Family Advisory Council of the Champlain Local Health Integration Network Renal Regional Program, Judith Fleming, and Marie-Eve Chainey for their contributions to survey development. We would also like to thank the patients and research teams at both institutions for their support. See related Patient Voice, “A Patient’s View on Exercise and ESKD,” on page 171.